At Pipeshark, we are experienced in conducting professional and safe sewer line repairs, including pipe bursting, pipe lining, and sewer repiping services. We are prepared to fix collapsed, broken, offset, and corroded pipes with our equipment and knowledge. Pipeshark has an expert team ready to perform all forms of sewer line repair. We begin by understanding and respecting the needs of various types of clients. We work with homeowners, municipalities, commercial and industrial locations, and specialty projects. Pipeshark begins each sewer repair with a consultation and a sewer camera inspection. The sewer camera is a waterproof, robotic camera attached to an optic cable. The camera is inserted into the existing pipeline from an easy access point. The camera operator is able to direct the travel of the camera through the entire pipeline. All instances of pipeline disruption are videoed and the operator will discuss all findings with the client. Based upon the findings, Pipeshark has trenchless sewer repair options that will be recommended to our client. 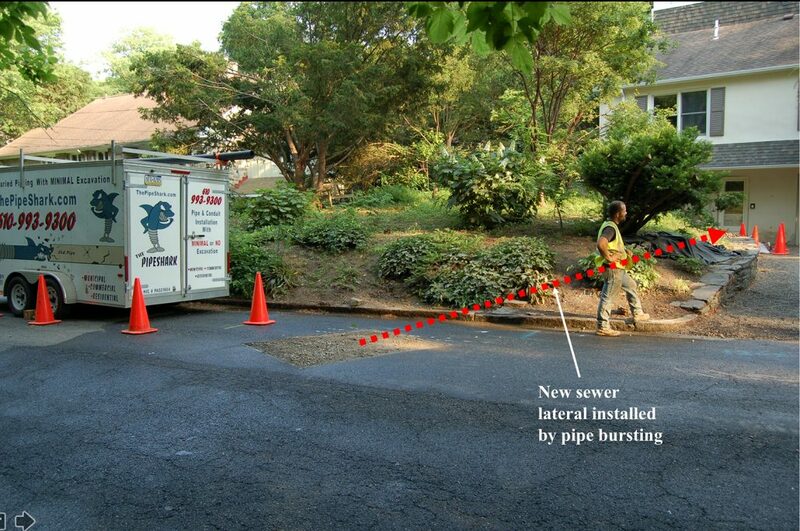 Trenchless sewer repair options refer to fact that no digging up of old pipeline is performed during the operations. The original pipeline stays underground and the above ground hardscapes and landscapes are preserved. Often the camera inspection will reveal a clog blocking the drain flow and corrosion attached to the pipeline interior wall. The corrosion is a rough buildup of minerals and other particles that make it easy for future clogs to snag and begin to grow. When these concerns are discovered, hydro jetting is usually recommended. Hydro jetting involves using high-pressured water and a rotating water spraying nozzle at the end of a flexible hose. The nozzle and hose are inserted into the pipeline and the water pressure is strong enough to blast away clogs and scour smooth the interior lining of the pipe. At other times hydro jetting is used to clean the interior pipe wall prior to repairing a crack. If we identify a crack in the pipe, the trenchless repair method known as cured-in-place pipe (CIPP) lining can be used to create a new pipe inside the original one. A sleeve coated with an epoxy resin is inserted into the pipeline. The sleeve is inflated, which presses the resin firmly against the interior pipeline wall. The resin requires only a few hours to cure and harden. A dense, smooth, new pipeline interior wall remains. The sewer camera can then be redeployed to inspect and confirm that the repair is complete. If the pipeline is extensively damaged, the trenchless process known as pipe bursting is employed to completely replace the old pipe with a new one. This process also leaves the surface of the affected property undisturbed. Pipe bursting utilizes a chain and pulley system, a new incoming pipeline, and a pipe bursting head attachment. The chain in placed inside the length of the old pipe with one end attached to the pulley system. The other end of the chain is attached to the pipe bursting head, which is in turn attached to the beginning of the incoming pipeline. The pulley system drags the pipe bursting head and attached new pipe into the original pipeline channel. The original pipe is burst into fragments during the process. The fragments are safely pressed into the surrounding soil. At completion of the project, a new pipeline lays exactly in the place of the old pipeline. Homeowners need sewer issues fixed quickly so that the daily routine can return to normal and the home can return to being a place of comfort. Municipalities require Pipeshark to work with their crews on large-scale projects in a timely and low impact manner. Industries, such as food processing plants, demand strict sanitation regulations, avoidance of any contamination, and accuracy matched with speed. Commercial establishments, such as hospitals, universities, or professional offices, need to keep their daily operations running as smoothly as possible during the duration of the project. Golf courses and national parks are examples of the specialty projects we have supported with a clear understanding and respect regarding unique needs and specifications. If your sewer lines are backing up or suffering from other problems, our staff at Pipeshark looks forward to bringing our respect, our extensive experience, and our dedication to excellence to your project. Call us to learn more about our services and how we can help you. Our Pipeshark team is extremely experienced with sewer line repair and offers these services for maintenance, pre-purchase information, and troubled pipeline diagnosis in houses, condos, and apartment complexes across Pennsylvania. Our experience also extends to working on projects with engineers, municipalities, and governmental agencies while maintaining the standard code and regulations. Call our staff of experts to schedule a consultation and learn more about how we can help you. Pipeshark serves the Harrisburg, Hershey, Lower Merion, Lancaster, Devon, Paoli, West Chester, Berwyn, and Wayne, Pennsylvania areas. We have also traveled as far as Washington D.C. to support specialty project teams.